Is it time to tackle that resiodential renovation project ? How about getting rid of that junk that has been accumulating around your home? Dumpster Rental by Tin Tipper can help you with the above problems! There is no better way than renting a dumpster to get rid of all that clutter. Many customers always go back and forth as to how much room they will need and what size dumpster they should get ? Tin Tipper Dumpster Rental offers a wide variety of sizes. It is crucial that you pick the right size to avoid running out of room for your project. When in doubt, we always advise our customers to pick a bigger size! Here are some excellent tips that can make your life easier by selecting the right dumpster rental size. What Dumpster Sizes are Avalaible for Rent ? The first thing you’ll need to do when choosing a dumpster for rent is to figure out the dimensions of the bins that are available for rent. Tin Tipper offers 3 sizes! 30 and 40 yard dumpster take up a lot of room you may not have. They are also very costly. Don't just rent the biggest dumpster you can find as you may not need it. Call one of our experts and we can help figure out the right size at 239-677-3525. Have a dumpster delivered to your door that will be the perfect size and reduce spending more money than needed to complete you next project. How Much are You Really Going to Throw out In the Dumpster? Every project has a budget, reduce unnecessary expenses by picking the perfect and right size dumpster. This is why it is critical to estimate how much you will be getting rid of. Renting a dumpster in Fort Myers doesn't have to be intimidating. 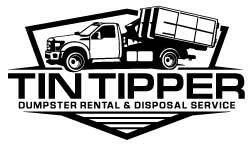 This may be your first time, but rest assured that our team here at Tin Tipper Dumpster Rental will help you and show you how easy it is to start your next renovation, remodel, kitchen tear out or clean out. Our 11 cubic yard container is perfect for flooring tear out, garage clean out, or doing a small remodeling project. Our 15 cubic yard dumpster is the right size for a condo or apt move out project. Up to 2500 sq ft of shingles for that roof job. Our 20 cubic yard at Tin Tipper is perfect for your larger remodeling project. cleaning a larger garage, or doing a complete bathroom or kitchen demolition. Carpet removal, Tile Removal, and cabinetry removal! We Are Here to Help Answer Question About Dumpster Rental Services? The information listed above can start to get you on the right track about ordering the right dumpster size. But remember that if you’re still trying to figure out the right size let us help you make the decision. Our experience in the dumpster industry can provide you with the assistance you need. Our team at Tin Tipper know what will and will not fit in our various dumpster sizes. We will listen to your project specifications and make the appropriate recommendation for container size. Send us some pics via texting, this is always a quick response. Over the year our yellow, eye catching, dumpsters have been spotted everywhere in Cape Coral, Fort Myers, Punta Gorda, Lehigh Acres, and more. Have the Right Size Dumpster Delivered Today! Don't waste any valuable time calling around, we are the most affordable and cost effective dumpster rental company in Lee County Florida! Our google reviews for our dumpster rental service also speak for themselves! We are the top rated bin rental company in the area : Click here to see our dumpster rental reviews! 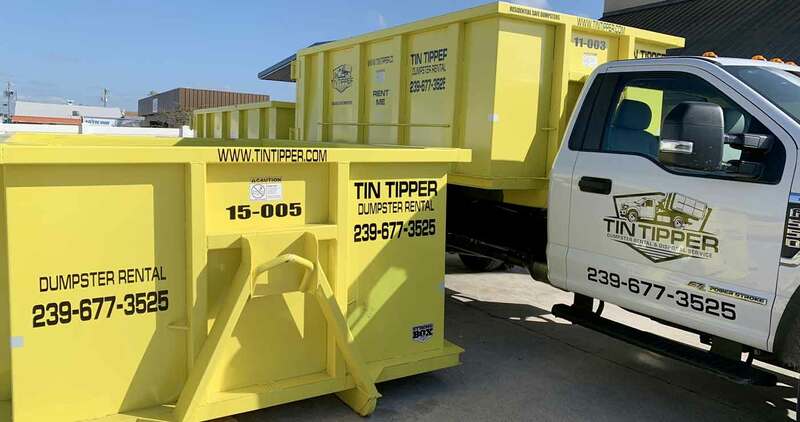 Contact Tin Tipper Dumpster Rental today and let us show you the quality service you deserve.